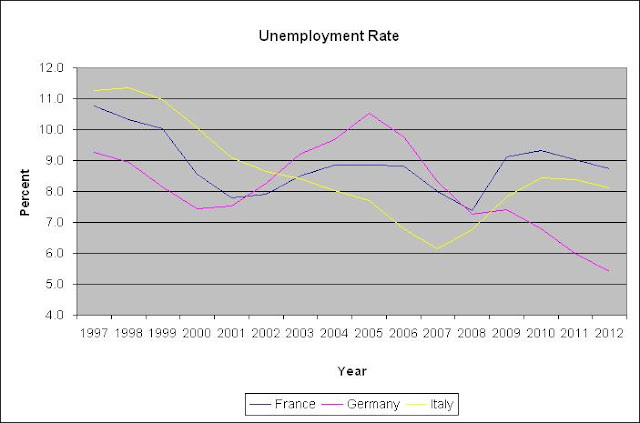 Markets and Beyond - An Independent View: Who should be single A rated: Italy or France? Who should be single A rated: Italy or France? I am amazed that France rating has not been downgraded as yet: it does not deserve a AAA by a long margin. 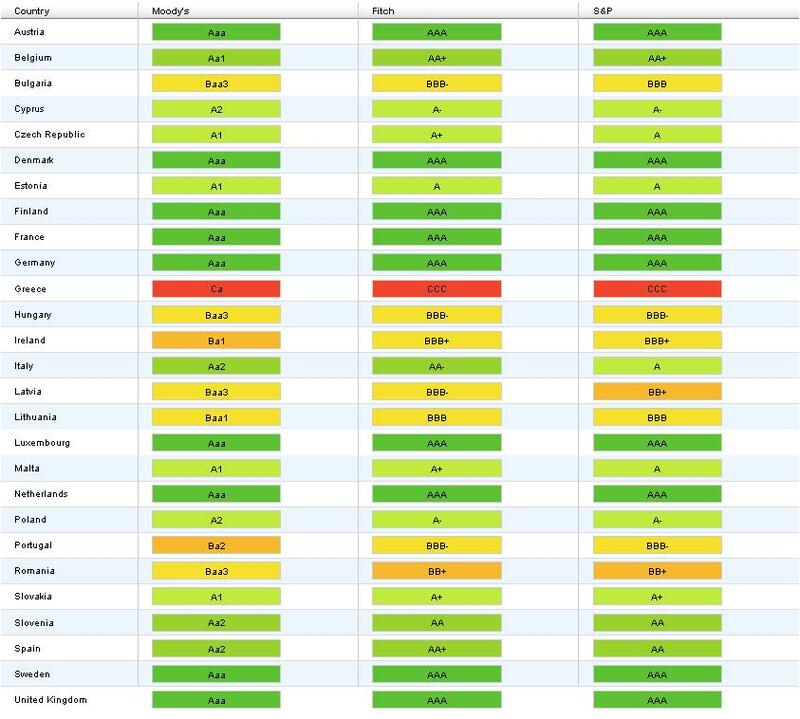 First, have a look at current rating for European countries (please note that since this table was published, Moody’s downgraded Italy 3 notch to A2 from Aa2, i.e. the same as Poland or Cyprus). 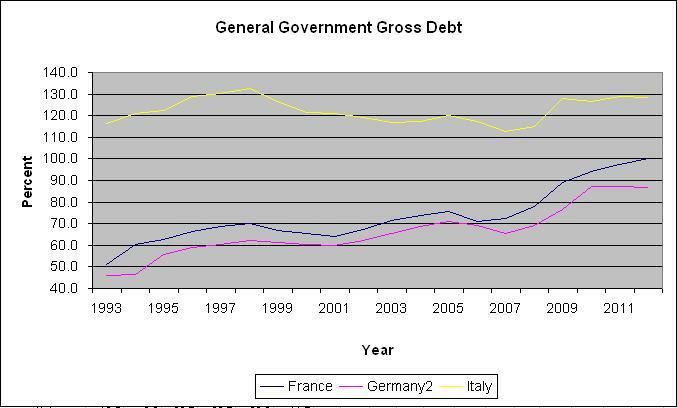 This downgrade is probably justified in itself, but I am questioning how France can retain the top rating. From data published by the OECD in May and the IMF in September, France is in a worse shape than Italy according to many indicators. 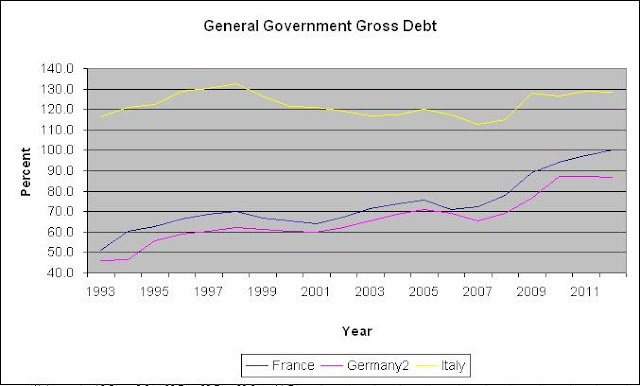 If the debt/GDP is the Achilles heel to Italy, its growth is nowhere comparable to France’s which is catching up quickly: +6% for Italy for the period 2000-2012 and +52% for France. 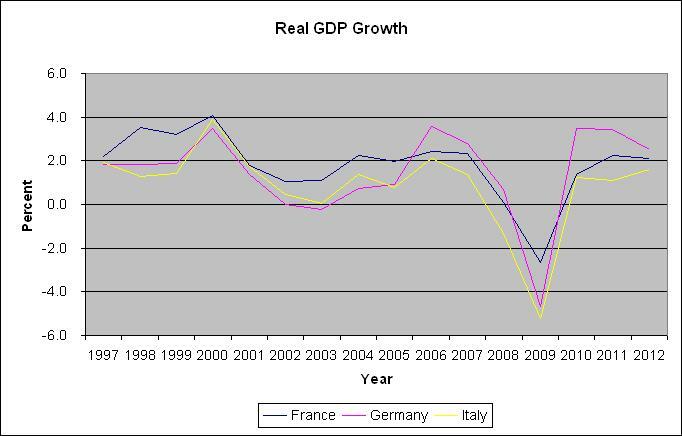 France is much better off with GDP growth twice the pace of Italy during 2000-2012 at 1.5%. 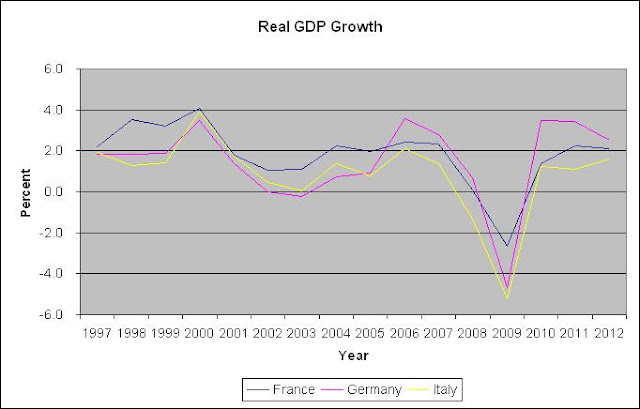 French growth is however mainly due to domestic consumption spurred by the state welfare that France can no longer afford. 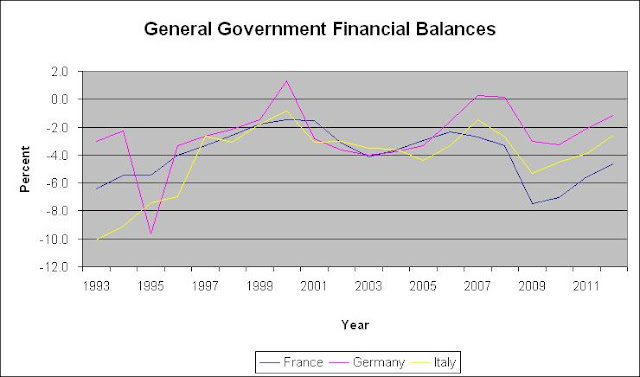 The French welfare state largess translated into higher budget deficits whatever the Government (France hasn’t had any balanced budget since 1978): the Maastricht 3% deficit ceiling was respected only 4 times since 2000, France doing much worse than the eurozone average since 2008 (-5.9% vs. -4.6%); - Italy fared better with -4.1%. 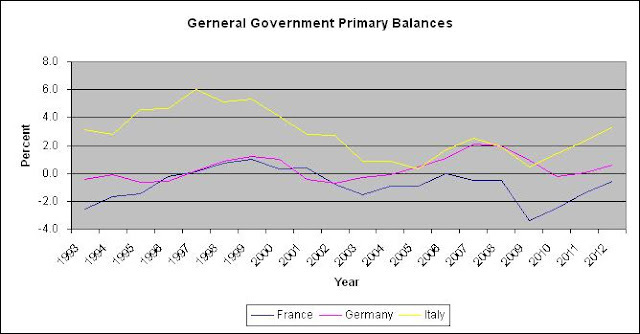 Analyzing further the budget, the situation looks even much worse for France: its primary budget balance has been negative for 10 years whilst Italy had always been positive (note that Italy’s primary budget is even much better than Germany). The IMF does not expect France’s primary budget to become positive before 2015. 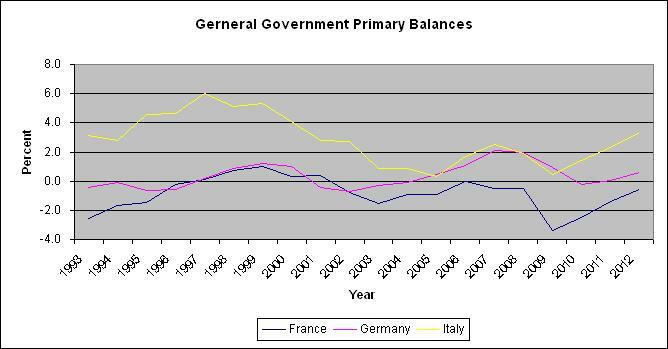 This indicator is not helping out France’s precarious position, to the contrary. 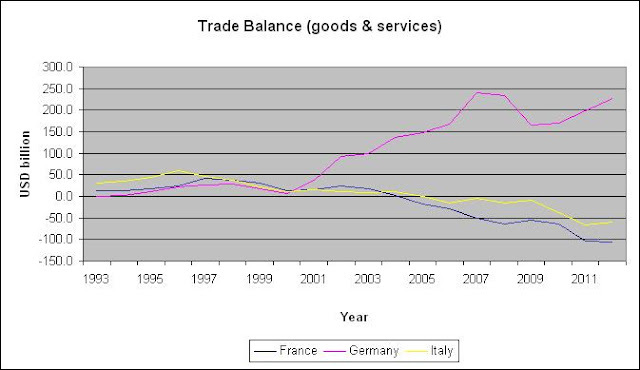 Since 2005 France has experienced increasing trade deficits, together with Italy but with an incomparable magnitude: USD 489 billion cumulated, 2.3 times more than Italy; Germany in the meantime accumulated a USD 1550 billion surplus. In percentage of GDP the analysis is the same. True France enjoys a net investment income whilst Italy is negative, which translates into a comparably better current account for France. Unemployment is another indicator where France is not comparing well with Italy, underperforming since 2003. France does not deserve the top rating with the three main rating agencies (by the way, when European politicians accuse these agencies of an American plot against Europe, beyond being a “scapegoating” affirmation, they should remember that Fitch belongs to a French company, Fimalat). According to the indicators presented, France should hardly be better rated than Italy. The “funniest” of all is that Dexia CLF is going back to CDC (the French state owned financing vehicule) where it originally came from under the name of CAECL. From privatization to nationalization, 20 year of incompetent board of directors that let an incompetent management expand all around the world into risky businesses without the means (read capital) of their ambitions. Please note that I do not blame the new management that arrived after the 2008 rescue since Dexia was doomed: there was not much they could do, and they probably did what they could with the legacy they got.